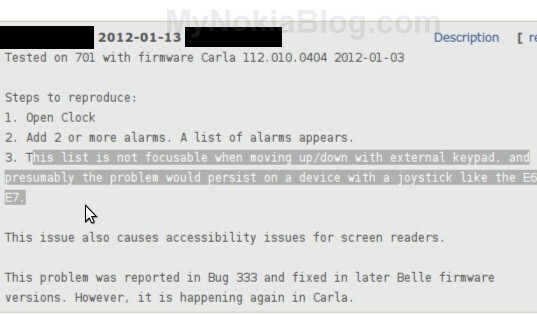 After the story of a Nokia Carla sighting at Nokia Developer forums (with E6) a few of you checked it out to confirm testing and bug list being compiled for Carla (At least as indicated by the thread titles). Here’s another recent screenshot that shows that same Nokia Carla v112.010.0404 tested on the Nokia 701. It notes that there are issues presumed on devices like the E6 (mentioned previously) and E7 due to the D-pad/joystick navigation not working in the menu. Just like before Anna was even released we already saw Belle, we’re seeing more solid info on Carla before we get the Belle update. Think of that on the positive side that it would be better knowing there is constant revisions and improvements rather than nothing happening. Apparently there are still lots and lots of bugs in Belle, hence the delay. Bugs that are apparent in the original S^3/Anna that’s not on the originally designed Belle phones.